The Star Wars food item that truly started it all was Luke's blue milk. Why is it blue? Because it’s bantha milk, of course. 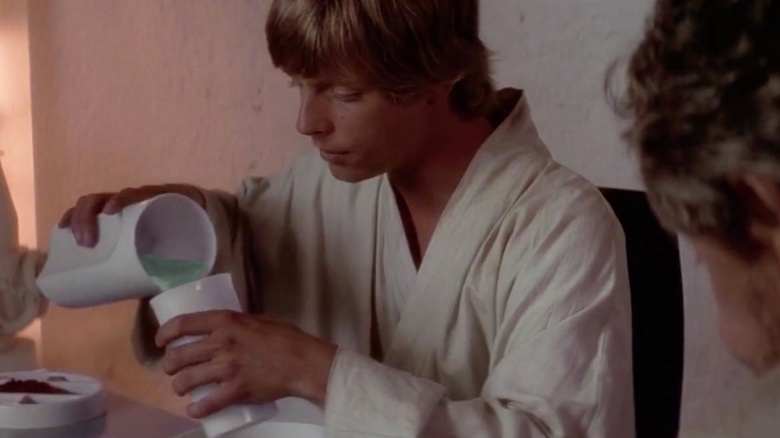 In the original film, the blue milk is simply a part of Luke and Uncle Lars’ balanced breakfasts, but the beverage has since popped up in both the prequels and Rogue One as well. Blue milk has become such an symbol for Star Wars fans that even Rogue One director Gareth Edwards took the time to enjoy a glass of it when he visited the original sets from A New Hope for his 30th birthday, 11 years ago. An old wizard, a farm boy and two droids walk into a bar. That’s essentially how the famous Mos Eisley cantina scene begins, but it’s what follows that everyone really remembers. First, Luke’s altercation at the bar, which results in Ponda Baba's arm getting cut off. Then there’s the infamous Greedo and Han interaction (never forget, Han DEFINITELY shot first). Also, let us not skip over the bartender’s inherent prejudice against droids. Even in a world where this guy can rule an underwater kingdom, droids can't even get a seat at the bar. Yoda is definitely the greatest gourmand in the galaxy. In the first few moments of Luke meeting Yoda, the small green Jedi is already rummaging through Luke’s snack collection, looking for treats. Then again, he’s been marooned on Dagobah for 20 years at this point and probably misses some of the processed foods that he learned to love on Coruscant. Then, once Luke and Yoda retire to Yoda's tree layer, the old Jedi prepares a meal that includes wild mushrooms and a live snake. Apparently, the Paleo diet is an essential part of Jedi training. These two share a few meals during the prequel trilogy, but this one certainly takes the cake (sorry). Anakin uses his force powers to slice a pear for his beloved Padme, which for some reason she then decides to eat with a fork and knife. Forget Jar-Jar, this is by far the least sensible detail from the prequels. In Attack of the Clones, Obi-Wan wanders into a bar with Anakin during a hunt for a bounty hunter. While Anakin searches the room, Obi-Wan heads to the bar for a shot of blue Curaçao and gets offered death sticks, a mild hallucinogen found in the Star Wars universe. Obi-Wan pulls his signature force trickery and convinces the dealer to go home and rethink his life after turning down the offer. However, what if Obi-Wan did buy some death sticks? It certainly might’ve made Revenge of the Sith more interesting. Life as a scavenger on Jakku is hard. You search through crashed Star Destroyers for spare parts that you hope to trade for daily bread rations. 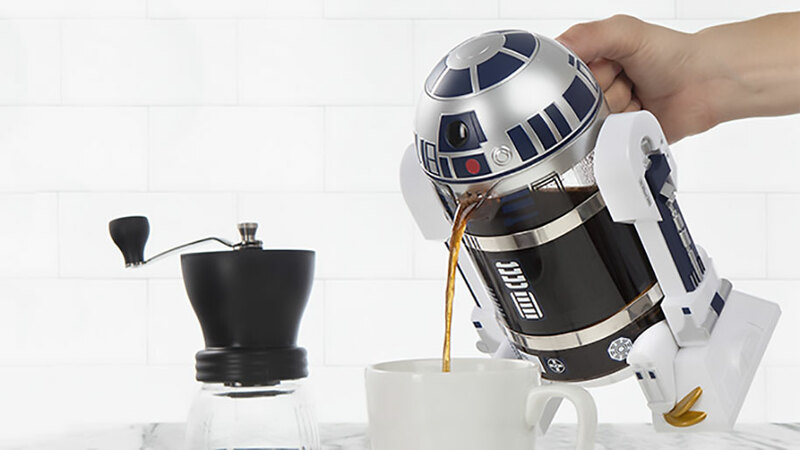 Occasionally, you find a droid that can get you more science bread than you could ever want. Instead though, you have a conscience and choose an interplanetary odyssey over more bread. Silly Rey. Fun fact though, the insta-bread from The Force Awakens actually exists. It’s true, all of it. Seriously, Rey is always eating. Well, that is when she’s not learning that she has mega-force powers or deciding to take the Millennium Falcon for a spin. As soon as Rey, Finn, Han Solo and Chewbacca arrive at Maz Kanata’s castle, Rey immediately goes for a snack. In this case, it appears like some form of alien fruit, but it’s really just an apple with romanesco stuck on top. Interestingly though, Rey is the only one eating in the scene and soon after, she experiences a hallucinogenic dream in Maz’s basement. Coincidence? I'm just surprised she didn't mumble, "I have a bad feeling about this," while chewing.